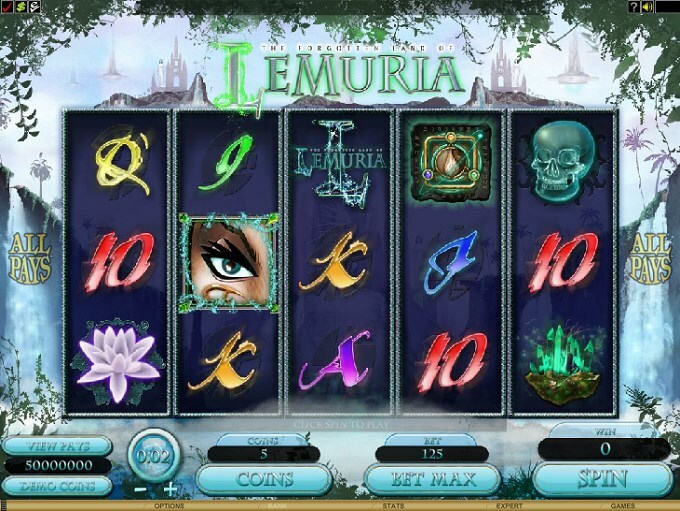 Lemuria is one of those slot machines where you encounter a fantasy element, so it feels like a right choice if you’re a fan of the genre. Lemuria seems to be a land where flying castles are a real possibility. You can see them in the background, while the symbols are much more common and less related to fantasy. Microgaming didn’t create a truly stunning game here, not like it could’ve since the fantasy theme allows for it. The game uses the AllWays system, which gives it 243 ways to win/paylines. It has 5 reels. It offers wilds, scatters and a bonus feature, plus a jackpot of $7,500. 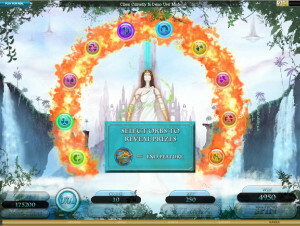 As features, you will find that there are wild symbols present, scatters and a bonus game. Overall, it’s far from an impressive list. The All Ways system, while not mentioning exactly how many chances to win you get, has 243 of them, the standard number available on a 5 reel setup with 3 symbols on each one. The combinations form by being on the right reels, not on the right paylines, and you get paid a lot more often as a result. Let’s look at the wild symbol first, the one which has the Lemuria Logo on it. This symbol will not give you a prize, but it will act as a substitute, so you will find that it brings you money often enough. Whenever the wild appears on the right reel, with other matching regular symbols being on others, combinations will form and it will act as a substitute. In a game with ways to win this is a very important feature to have. There is the scatter as well to consider, a symbol which appears even on non-consecutive reels and forms its combinations. It pays you between 25 and 500 coins, by having three to five symbols present. The image chosen for it is that of the Queen, though you only see one of her eyes in it. You also have a bonus game that you can start, where the requirement is that you get 3+ symbols with the Queen in scattered positions. 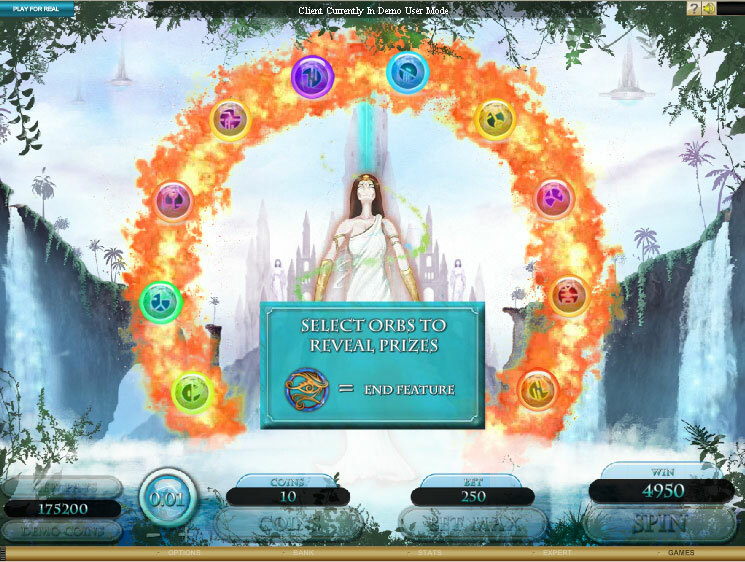 Once the game starts, you see the Queen with various orbs all around her. You can make picks and get prizes from those orbs, the feature ending when you find the Eye symbol. You have a betting range of $0.25 to $125, the game using 25 lines when betting is concerned, even though the reels have ways to win on them. Each line gets up to 10 coins, with values being from $0.01 to $0.50 for each one. That’s a maximum line bet of $5. With the top prize giving up to 15,000 coins, the cash value goes as high as $7,500, which is actually not that bad for a slot with ways to win. Though in theory the game sounds good, the implementation is not that fun to look at. The symbols are not detailed enough and the colors make it look boring. Even the choice of symbols is wrong, not giving you a real idea of what’s supposed to be going on in these forgotten lands that you’re exploring in the game. 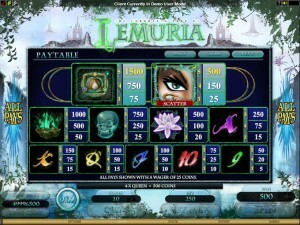 Symbols: Lemuria Logo (wild), Queen (500x, scatter), Elements (1,500x), Crystals (1,000x), Skull (750x), Flower (500x), Ace (250x), King (150x), Queen (100x), Jack (100x), 10 (75x) and 9 (50x). I didn’t find the game that interesting, though the idea behind it is a good one. The execution isn’t good enough when it comes to the design, the prizes are not impressive enough and the features are only average. This The Forgotten Land of Lemuria slot is offered by all online casinos with Microgaming software, playable either in practice or in real money mode.